Reflecting nebulae in a dark nebular field. Date: Sept. 20-24, 2009 . The six fairly bright stars in the center of the blue reflection nebula (together with the nebula they illuminate) are called NGC 7129. 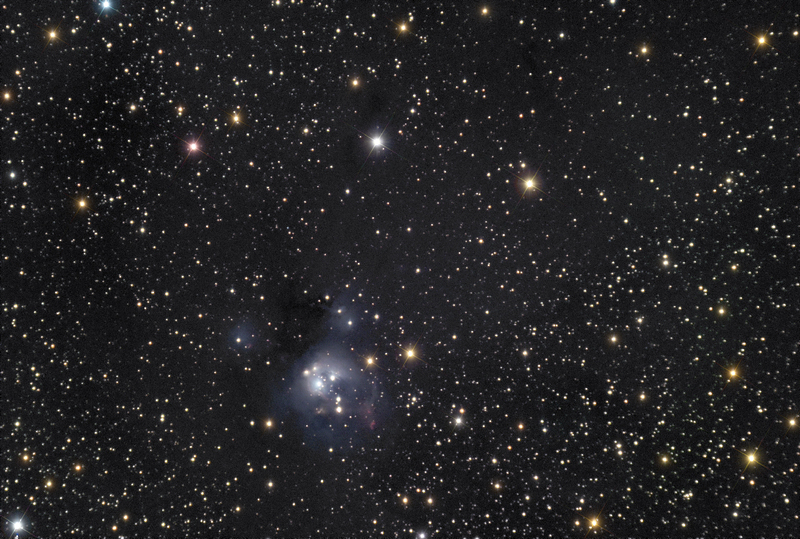 The small nebula to the NE (upper left) of the main nebula is NGC 7133. It is illuminated by a single star. The two small nebulae slightly to the NW (upper right) of the main nebula, each illuminated by a star, are (top) IC 5133, and (bottom) IC 5132. The reddish emission nebula to the SW (lower right) of the main object is Lynd's Bright Nebula 497. A dark nebula that dims background stars extends from below the main object, surrounds it especially on the left, and goes up all the way to the upper right corner of the frame. Notice the markedly different star densities in the lower right corner of this image compared to the upper right corner. This dusty region is Lynd's Dark Nebulae 1181 and 1183.